1106 Design creates cover concepts based upon images that we suggest or you provide. Then, from these concepts, you choose your book's cover. 1106 Design's professional editors will edit your manuscript thoroughly, until it's ready for prime time. You approve the edits and make any revisions. Choose a page layout from samples we design specially for you. No templates! Your pages will look unique and beautiful. After typesetting, 1106 Design will proof your book carefully to identify those pesky errors that almost got away. Print on demand? Offset printing? eBook? We'll help you make some decisions about printing and distribution when planning out your project, and in Step 5, make sure your files are perfect for uploading, and format your eBook too. Strategize with our marketing experts to meet your sales goals. Most services can be completed in 2–3 weeks; we double up on some steps to save time. With necessary pauses along the way to review, reflect and revise, most books are completed in 90 days. If you need faster service, just ask! Before You Start: Plan! Begin with the end in mind. Ask yourself: Who are my readers? Where will they buy my book? What does my book look like? Based on that knowledge, you’ll be prepared to answer questions about where you will distribute your book (Amazon, retailers, etc.) and do some research to understand how best to distribute your book and how your decision impacts book marketing, printing and your book design. With this knowledge in hand, you will be on your way to learning how to self publish a book and able to start Step One! Most services can be completed in 2–3 weeks. Some steps overlap; for example, book cover design and editing can be done at the same time. With necessary pauses along the way to review, reflect and revise, most books are completed in 90 days. Throughout the process, we will work together, and our professional team is with you all the way! If you need your book faster (e.g., for an event), please let us know. We’ll do everything we can to meet your deadline. 1106 Design Indie Publisher Resources page: Links to videos and interviews with self-publishing experts. 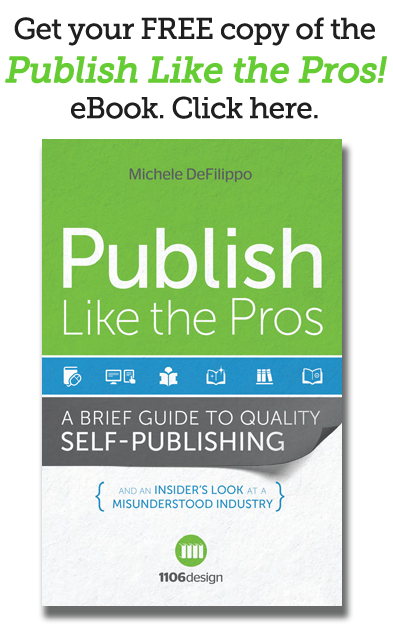 Tips for Indie Publishers: Tips on how to self publish a book of your dreams, updated weekly.